Overall: We stayed there for a summer in 2009 it was a wonderful experience then and again this visit. We know the rhythm of the village so enjoy all it has to offer Enjoyed Most: The view and the separate apartment. Enjoyed Least: They could replace some of the furniture in the living room as it is the same as in 2009 and it has not worn well (arm chairs in particular). Surrounding Area: There was an olive oil festive happening in the local village. The village has everything you need, butcher, restaurant, coop, cafe etc. Easy 25 min train ride to Florence. 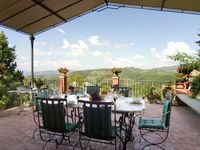 Nearby Events or Locales: Sant'Allero - 7 minute drive to the train station Tips or Restaurants: I would use/take advantage of all of half a dozen businesses in the town. Other than that we went into Florence Check In Out: Keep in mind that heating is charged according to consumption. We used it sparingly during our week and were charged 120 Euros on check-out, for reference. Note also that heating is only allowed between November 1 and April 1, by law.